Exclusive for Tahoe.com - 25% off all Ski and Snowboard Rentals. Click here for more info. Since 1994, Powder House has grown to become the largest and most complete ski rental & snowboard rental shop in South Lake Tahoe, California. For convenience and value of ski & snowboard rental packages, you cannot beat the Powder House Ski and Snowboard of South Lake Tahoe. Please contact us by phone (800) 619-7470 or e-mail us at info@tahoepowderhouse.com with any questions you may have regarding Lake Tahoe Ski and Snowboard Rentals, and Accessories. 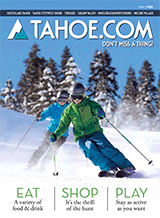 Stop by and "check out" the Very Best Ski and Snowboard Rental Equipment on the Market in South Lake Tahoe. RESERVE YOUR SKI & SNOWBOARD RENTALS NOW!